Fabric covered salt storage buildings are not a new trend with landscaping and snow removal professionals. These hoop shaped buildings have offered a cost effective salt storage solution for many years across the United States, Canada, and other countries. In additional to cost efficiency, hoop buildings offer flexibility and portability unlike the traditional wood or steel framed building. 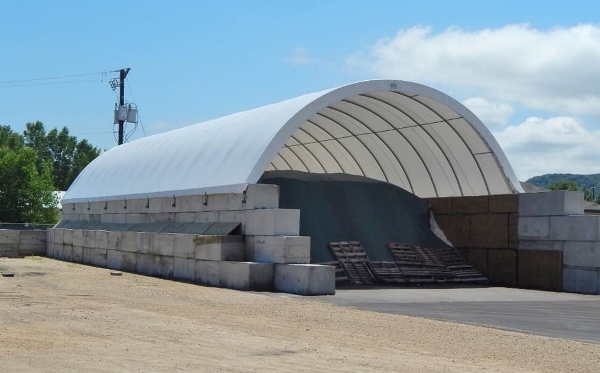 Due to the nature of the design and construction, hoop shaped salt storage buildings can be quickly erected on concrete walls, block walls, and even wood header walls for increased internal clearance. Galvanized structural steel tubing provides for corrosion resistance and superior strength under all weather conditions. Flat based foot pads with pre drilled holes allow hoop salt storage buildings to be easily constructed on a stable mounting surface. Optional end panels and framing are available to prevent moisture intrusion from one or both ends. All units include a detailed assembly manual for quick setup and construction. We offer sizes ranging from 12’ – 42’ wide to satisfy any landscaping professional application. Contact us today for a custom quote to keep your salt out of the harsh weather conditions.